The Cat is Out of the Bag! Most of you have heard the news....Jeff & I are expecting! We are 10 weeks along (so close to being out of the first trimester!!). I really wanted to wait until after our first doctors appointment before telling anyone. It has been a long journey! We've been trying for two years without any luck. We did all those fun (not so much) doctors appointments that you see in movies that causes nothing but humiliation and pain. We chose not to go any further with treatments because I just do not like to mess with my hormones and my body with drugs. So, we just kept praying and hoping that it would happen on its own! Back in January, I wa so frustrated that I finally closed my calendar and decided to completely STOP trying! I know that Jeff was thrilled to hear that. I let go of the control and here we are, God provided for us! Its amazing what happens when you simply let God have control! So, we are due October 30th and couldn't be more excited. We were able to see the baby, he/she was doing a jig that day, dancing and moving all around. The heartbeat was the most amazing sounds I've ever heard at 183 bpm! So....I am sure that I will be updating again at the end of the month with our next appointment! Woo Hoo is right!! So happy for you!!! Can't wait to hear updates and see photos throughout the pregnancy! Your little one will be in my prayers! CONGRATULATIONS!! We are so excited for you and Jeff! I have been trying to get ahold of you to tell you congratulations but I will just have to leave my congrats here until we can catch up. I am SO excited for you and Jeff. You will be wonderful parents. Can't wait to catch up! Oh, and I think with your love of the fall it is so appropriate for your baby to be born in your favorite season! Take care of yourself. PRAISE GOD!! I'm so very excited for you and thrilled that God has finally answered your prayers! We have already brought Baby Walters before God and will continue to do so! Thank you all so much! I just don't know how people get through life without prayer! And Amy....I am so sorry I missed your calls, we were in Missouri announcing our news to the in-laws! We WILL catch up! Congratulations!!!! I am so happy for you and Jeff!! Our God is so Good!! Congrats! What a joy it is to hear that heartbeat at each visit as you "check in" on your little one. I always held my breath until the moment I heard it. I knew about this when I read the story about your "lost" doggie. I think this explains it. 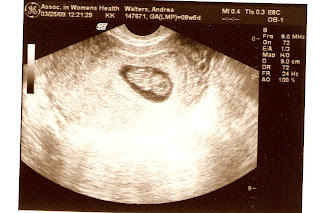 :) Count this as the first of many pregnancy brain incidents! :) :) God's Blessings on baby Walters! Congrats! I thought that you were "showing." We're so happy for you. I know how it feels to try and try and try without success. You are due right around Alyssa's 2nd birthday! We'll be praying for you.